This page is for regular visitors (or repeat offenders) who want to find out if anything has been added or changed on the website since their last visit. The most recent updates will be posted here at the top of this page for convenient viewing of new material or website changes. Just a quick note in case any of our Comcast customers peek here. Comcast seems to have our e-mails blocked, so we're unable to e-mail you at a Comcast e-dress. You can try white listing us, but we can't guaranty that will work. If you have an alternate e-mail address, please send it to us if you'd like to get on our mailing list or if you've not been receiving our e-mails. Also, it's pertinent that we have another e-mail address for you if you place an order with us. Thank you! A few news items. First, We have a new Tonga thing happening, so hard and soft corals are available 'a la carte' from there now. They have great Acros! Meanwhile, at the other end of the spectrum, it sounds like Viet Nam is not going to stay open. So if you had thoughts of getting it, do so sooner rather than later. It does not look good, it may close in the near future. There are no more large combo rocks available from there already. Indo and Fiji are both still offline for coral exports to the U.S., there is talk something might happen in Fiji. 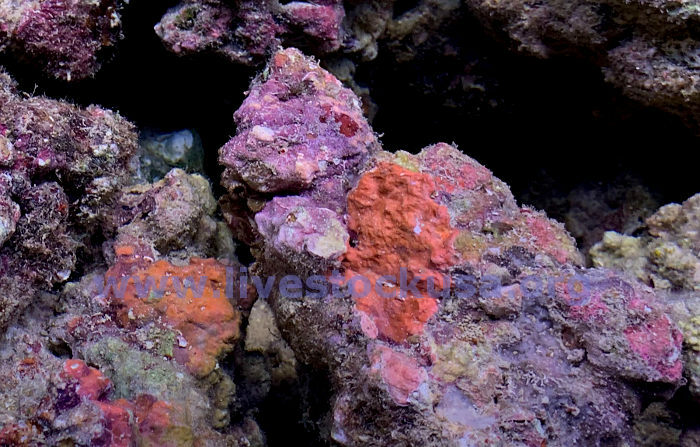 There is cultured live rock now from Fiji, a bit expensive, but good encrusting coverage from being under water two years, and so something that will work in a pinch. All the various tanked Australia corals are A-grade fantastic. You will not be disappointed. Use the Fish or Coral List Central pages (links at top of any page) to easily see recent updates, or e-mail and ask for one, we can send an Excel file with a dozen or so tabs. A reminder ... we cannot e-mail to Comcast accounts, you&apos;ll need to give us another e-mail address to receive e-mails from us or you can try white listing us. There is Fiji live rock! They found it! The lost rock. It is cultured and made from a combination of cement, oyster shell, and coral sand and bits. It has been under water two years now and looks great. It is not real old eroded coral pieces, but the overall effect is pretty close to what regular Fiji live rock looked like. Here are a couple of photos of it. 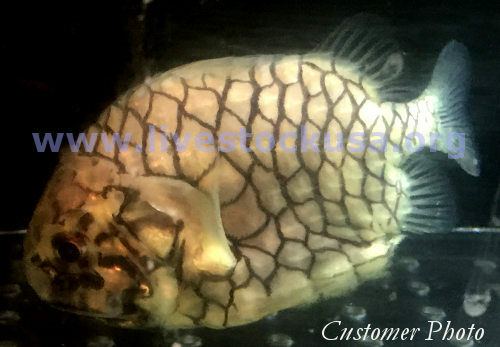 Additional photos can be seen on our Live Rock Photos & Pricing page. The boxes will be 48 pounds, $7.25 per pound. A box then is $348. Current schedule has it arriving Thursdays with Fiji fish shipments, so Friday to you. Send us an e-mail if you want to place an order for the next shipment, or use the link for ordering live rock on the page below! Check out the recent photos of Australia Acros! Here is some news about some of what&apos;s happening out there in the fish and coral land of the Indo-Pacific. Indonesia and its neigbors like Bali, Kupang, Manado, etc., remain closed for coral exports. Still people are working on it, still nothing. Eventually, there will probably be cultured corals again, but no live rock or anemones. 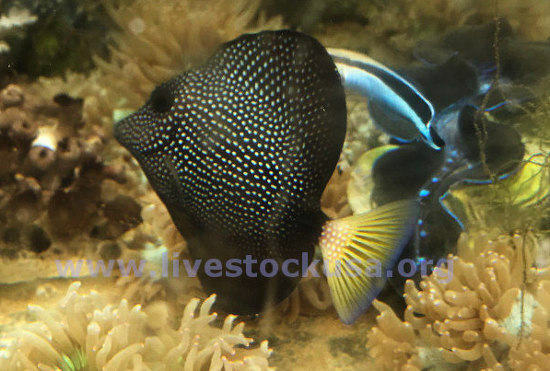 Fish and inverts are generally unaffected and available. In Fiji, the closure there is being worked on as well, da man is there working on it, and probably something will happen to allow corals out again, but like Indo, no more live rock. And they will be more expensive when they reopen. 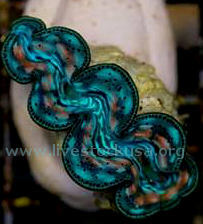 Viet Nam remains unaffected, so good shrooms, zoas, and some leathers can still be had there with good pricing. Tonga which has been a key fill-in for the last year, has an issue. We are going dark on it for the time being. No Tonga coral orders will be accepted for now. Sorry! There is a bacterial problem in their water. From Australia, there are shipments every month or so of a dozen assorted Acropora or Euphyllia boxes, and as often tranship a la carte ordering. Oz is the only current source for Acroporas and other hard corals now. At least they are still shipping, but of course at the high-end of prices. The great news is that there are a couple of new box-lot specials, tanked in L.A., of Australian corals, with both frag and wild options. These are an outstanding deal for the prices. The $20 frags are huge, and the bigger overgrown frags are the size of medium to large corals. The wild mixed box are mostly medium sized. For live rock, there is a guy on an island in the Pacific right now setting up to ship live rock. We are hoping to hear in the next couple or few weeks if it is ready to go. So there is light at the end of that tunnel, it is getting closer, and soon there will again be 5-star, AAA-grade, real deal, air freight fresh live rock from the Pacific. I am guessing it will be higher too. They are working on the freight rate negotiations, which is most of the cost of it. So, for Acros or hard corals it is Aussie or the tanked specials. For softies, it is Viet Nam. For live rock, hang in there baby! We hope you had a great holiday season and Santa found your tanks! There are good hard corals available from Tonga and Australia. There are good soft corals available from Viet Nam. Tonga has some few softies. All the usual fish sources are open. Just to update a little bit on the hard coral export ban from Fiji and the Indonesia areas, those remain in place. People are working on things and we will have something up here as soon as anything breaks. The Indo area closure includes Bali, Kupang, Manado, Java, any of the Indonesia area sources. Currently there is no fresh air freight Pacific live rock available. People are working on things, we'll have news here when it breaks. Tonga and Australia both have great Acropora if that is your heart&apos;s desire. 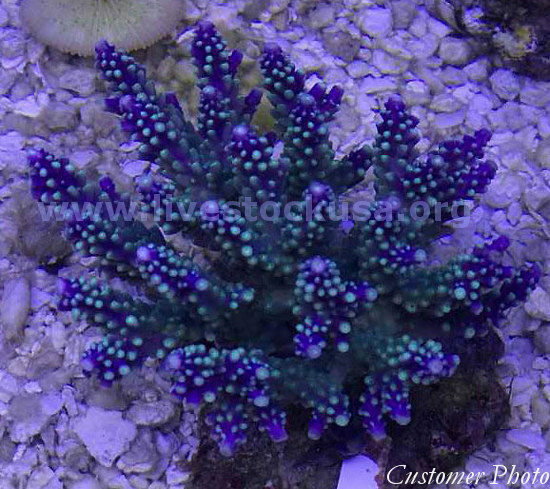 There are some new Australian coral frags we have available, a page will soon have some info & pix up of them, and for Aussie LPS they are a great deal. The .pdf lists page has recent copies of all the lists. E-mail us and ask to be put on the weekly mailing list which gets you a weekly updated excel file with most current offerings. We want to wish all of you HAPPY HOLIDAYS! We wish the very best for you and yours! Wishing all of our visitors a Happy Thanksgiving! Just to give a bit of an update on the availabilities situation. As for fresh real-deal air-freight live rock, there is still nothing currently available from the Pacific as Fiji and Indo areas were the main key sources. Both are closed for coral and live rock exports currently. Another source may open next year. It was close, almost happened, but unfortunately, went up in smoke. Also, there is no good word out of Indonesia for either live rock or coral exports being allowed again yet. There is, however, a lot of fake news that's been going around about Indo being reopened, but our advice is to not hold your breath! The Fiji and Indo issues are not connected, but both stopped all exports of corals, which includes live rock. Indonesia will have some announcement in January, but our sources are not optimistic. So, for the time, Fiji and all Indo area sources remain closed for coral and live rock, which includes Bali, Kupang, Manado, and anything else in the Indonesia CITES enforcement area. Viet Nam is not affected by the Indonesia closure and is still shipping soft corals, zoas, and shrooms. Fish are completely unaffected and no part of the coral shutdown. For instance, Bali is still shipping fish and inverts. The .pdf pages are a good way to see what any currently available source has. The Tonga list rarely changes and Fiji only every month or so. They all have pretty much the same things the last 30 years. The only hard corals available now are coming in from Tonga and Australia. Tonga is great, and fairly consistent, nearly weekly. Australia is a bit overpriced and comes in about once every month or so plus or minus, take or give. Both have great Acropora, whole wild colonies of very high quality. 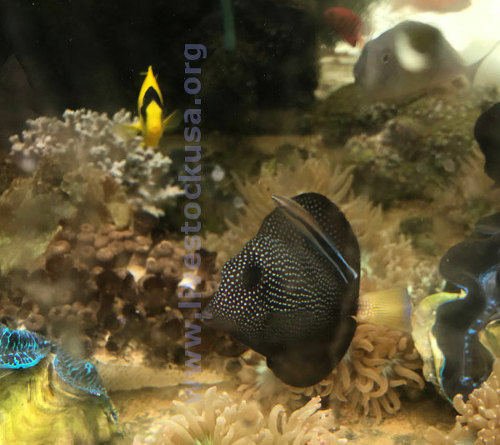 There have been lots of good rare fish available from several of the sources, Gem Tangs, A. kingi (Tiger), C. joculator and Scribble and even Clarion Angels, Port Jackson Sharks, Flamboyant Cuttles, all kinds of great stuff. A little bit of Red Sea too, via Sri Lanka or Philippines RVS. Keep in mind that shipping can sometimes be a bit dicey to some areas around Thanksgiving due to the travel load. If you want something before then, act soon. We watch the weather very closely as we have been having to use heat packs for shipments up north, while not in the south. For instance, sometimes when hurricanes were headed in, some shippers cancel shipments and wait a week. It can happen any time with winter storms too, if they don't like the looks of things, occasionally shipments get delayed a week. It helps to be as flexible as possible. Often suppliers close over Christmas and into the New Year a week or two as well. Plan ahead. A couple of updates on happenings out there in the big ol&apos; sea. Tonga remains the only consistent (almost weekly) reasonable coral source open that has hard corals, besides Australia, which is neither consistent or reasonable. Tonga has very nice to excellent corals, they are not cheap, but they are not low-end small ugly pieces either. That is the other Tonga place that we don&apos;t carry or offer. Viet Nam is open for softies, if you like zoas and shrooms, they are outstanding, and almost weekly. The Indonesia CITES enforcement quadrant (includes all adjacent islands like Bali, Kupang, Manado, etc.) remains closed for export of corals and live rock. Fiji remains closed for corals and live rock as well. Many usual sources are not available now. Hopefully something will change. There is word of the possibility of something on the horizon in fall, maybe, from Indo quadrant. While a permit was obtained to bring some high-end live rock in, things have since gone sideways and now it does not look to be happening. There is no air freight fresh real deal live rock available from the Pacific right now. Did you hear the whoopin&apos; and hollering of cheers from Florida? There are things being worked on, but nothing currently is a go. A different coral source is being tested this week that is not in the Indo CITES enforcement quadrant, so there might be another coral source soon if it works out well. We&apos;ll see. Meanwhile fish are unaffected by all the coral CITES issues. There are, in general, good supplies due to the &apos;summer slow season&apos; and there are lots of juvenile, young, and smalls of stuff available from many sources. There are some rarities too, Gem and Purple Tangs, Tiger (kingi) and joculator Angels, and lots of neat stuff if you scan the lists carefully. Great clams in the greenhouse too. To get a weekly excel file update via e-mail, just send us one asking for it. The .pdf lists on that page (link below) are updated monthly at least and can always be used to make an order. Several of the suppliers do not update their lists, like Tonga, Sri Lanka, and Fiji. They have many of the same items as they did 30 years ago. 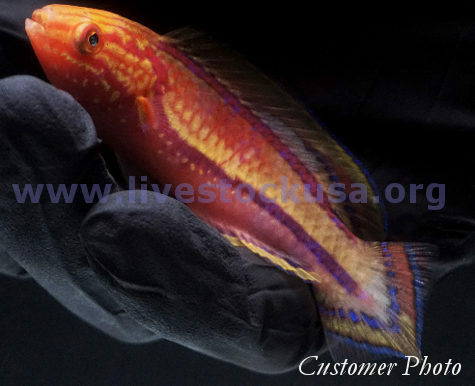 A big hat tip and thanks to Alan Z. from north Jersey for this great photo of a Vila Fairy Wrasse he got from the greenhouse. Beautiful photo of a beautiful fish! We have a some new photos up on our Customer Photos page thanks to a couple of real nice people that sent us some pix of their corals. There will be some fresh real deal live rock very soon, it is being worked on, we are anxiously waiting, permits are in hand, and it could be any week. 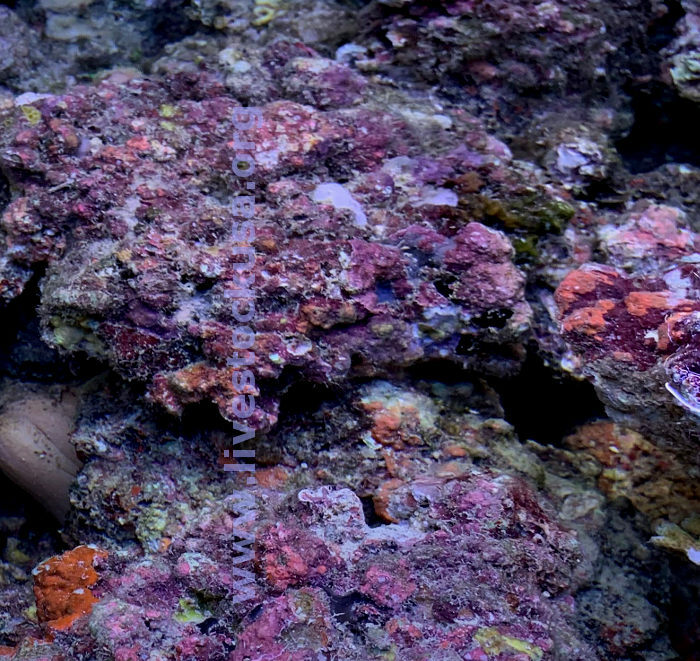 For corals and live rock, Fiji and Indonesia areas remain closed. This also includes Bali and Kupang, any Indo area sources. 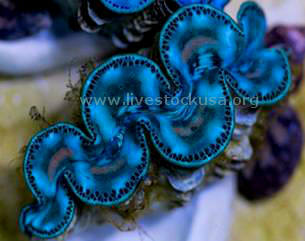 Viet Nam is not affected, so great shrooms, zoas, and softies are still available there. Fish are not affected by the coral closures. All the usual places have fair to good stocks in general now, since it is the summer slow season here. Now is the season when young fish &apos;fallout&apos; onto the reefs. So there are tiny, small, and juvenile of some fish available on some lists now that are seasonal. We have seen tiny Clown Triggers, Blue Tangs, juv. Regal Angels, etc., that are a once-a-year thing. Send an e-mail to get on the weekly mailing list and receive a regularly updated excel file of source lists. Tonga corals are on! Do ya wanna Tonga? Now is the time! In case you have not heard, there has been a ban placed on Indonesia coral exports. This includes live rock. It is believed to be temporary, and is expected to get fixed, but no one can say when. So far it is like Fiji redux. This does not affect fish, and is only for areas within the Indonesia CITES enforcement quadrant. So, for instance, it does not affect soft corals from Viet Nam. But it does close all the Bali Acro places, Kupang, anything Indo or Java, or any of the adjacent islands. In many ways this is very similar to what just happened in Fiji, and again without advance notice whatsoever to the industry. So at the present, Viet Nam soft corals are the main source for zoas, shrooms, and assorted softies. Hard corals supplies are virtually non-existent. Unless you wanna Tonga. There will be a Tonga shipment, currently scheduled for May 27th to LAX, the 28th to you. Tonga is what we called &apos;almost Australia&apos;, or, &apos;poor man&apos;s Australia&apos; for years. It has a limited diversity, but, the types are all different from the Indonesia area stuff. Big fancy colonies of great colors and health, and lots of unusual stuff not generally available from the Indo area sources anyway. Big thick branched Torches, big fancy Acro colonies, amazing colored encrusting Montiporas, great zoas and shrooms. Besides Acros, it is an area of somewhat low diversity within the groups, only single or a few types of each, but all different and unique types of pieces compared to what you are used to seeing elsewhere. Generally Acro boxes are all different, they do have a good variety of species of them. Call or e-mail for a list, you have a few days to get an order together, done and placed. Acro boxes are estimated at a dozen large colonies and $850 total including everything except the domestic shipping LAX to you, which you pay the airline when you pickup. There&apos;s a revision regarding the live rock mentioned below ... arrival is now scheduled to be May 13th. Here&apos;s a beauty for you. Look at that Cleaner Wrasse, isn't that spectacular? Oh yeah, well that Gem Tang isn't too bad either! That Cleaner Wrasse thought it hit the ich jackpot when it saw the Tang go in the tank. Probably thought "I can live a month off this fish," then it got over there and had its mind blown when it saw it was a Gem Tang. There are some few available right now from the greenhouse at $1200 each, 3-4". Fancy fish! Currently, there are no corals available from the Indonesia area CITES enforcement quadrant, which means Java, Bali, Kupang, Flores, Manado, everything in that area is offline right now. This is an annual thing when the new CITES quotas and permits are worked out. It can take a week or two, sometimes more, for everything to be settled and for it to all come back online. There may be some cultured stuff (Acros from Kupang) allowed out in the meanwhile, so stay tuned. The weekly mailing list is the best way to know what is happening any given week. If you&apos;d like to get on the mailing list, please send us an e-mail. This does not affect Viet Nam, so if shrooms and zoas were what you were looking for, no worries. Currently that is scheduled to go on April 8th and 22nd. There is talk of Australia shipping again soon, so if high end is what you want, be ready to jump when they announce, probably in two weeks. Word is Fiji is going to come back online, and is not affected by the Indo quadrant deal so when it comes back up, there will be more options. Hopefully soon, we will keep you posted! One last note, there will be some small Gem Tangs available with next weekend&apos;s shipments. They are 2.5-3" and $1200 everything included (F.O.B. LAX). There will be some limited bit of Indo (Java) live rock coming in to LAX this weekend. There is only a little bit. It is $6.25/lb., about 50-lb. boxes. Let's call it $300/box. You can Paypal that amount or we can send a link button to click and follow for that amount. Monday to you. I can't overstate: act fast! 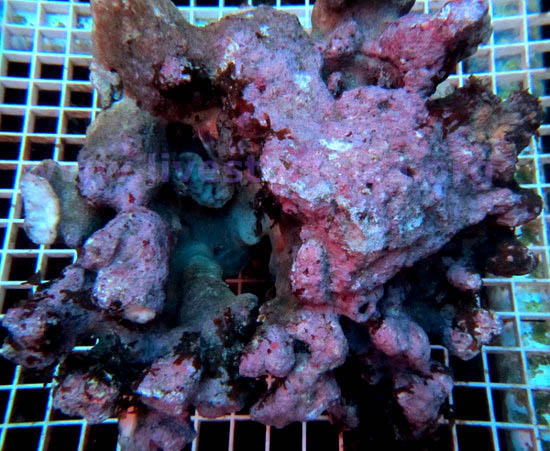 We have some recent photos from an order of Kupang corals you may want to see! In regard to Fiji live rock and corals ... please inquire as to current situation as there currently is a chance of availability. 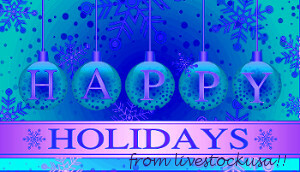 We hope you had great holidays! Congrats on making 2018. Just in case you haven't heard, Fiji is OFFLINE presently. We don't know what is going to happen, but for the moment we unable to accept orders for Fiji liverock or corals. We&apos;ll keep you posted! Of course, we are working on other liverock supplies, but at the moment, there is no real deal stuff to be had. Kupang is the best bet right now for good assorted corals. They have great A+ cultured Acros, and are available just about weekly like clockwork. For soft corals only, Viet Nam is outstanding in the shroom and zoa department. Anems too. They are every two weeks, next one probably on January 14th. Keep an eye on this page, or sign up for the weekly updates to stay posted on changes. Happy fish and coral hunting!